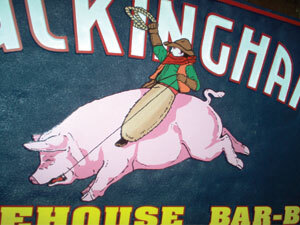 Buckingham Smokehouse located in Springfield, MO opened up a new location and wanted a sign that really stood out. We provided a sandblasted HDU wall sign that incorporated some fine detailed painting. Our artists hand painted the rodeo pig cowboy to give it a one of a kind look not found anywhere else.